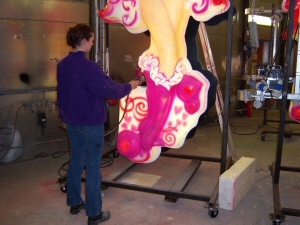 This section is intended to show the process involved in making 3D models for Blackpool Illuminations. To illustrate the process I'll be using a set of photographs of Cupide from the Decodance 2007 road feature, which was designed by Laurence Llewelyn-Bowen for the 2007 Illuminations. This isn't a detailed technical explanation of all aspects of the process as I'm an artist, not a qualified joiner, electrician or fitter. I might ask some of the guys at work whether they want to write something more detailed on the technical side, but for now there should be enough to give you a good idea of what's involved. Select a link from the menu to view the various stages of making a Blackpool Illumination. As well as my own photographs, why not take a look at this excellent video posted on YouTube showing the Sirens features being made in 2005. I think it must have been filmed just before I started work at the Illuminations. Thanks to CrackedButter for posting it! Let me know your real name and I'll add a proper credit.